Propane tanks can be used for everything from powering forklift trucks to providing heat for a grill. Since propane is a flammable gas, some people feel it's safer to empty all traces of propane from a tank once the levels run too low to practically use. This practice makes it safer to transport or store the tanks until they're refilled with more propane. In most cases, the entire process takes no longer than a few minutes to complete. Propane tanks are easy to empty. Disconnect the propane tank from any hoses or attachments and bring the tank to an outdoor location. 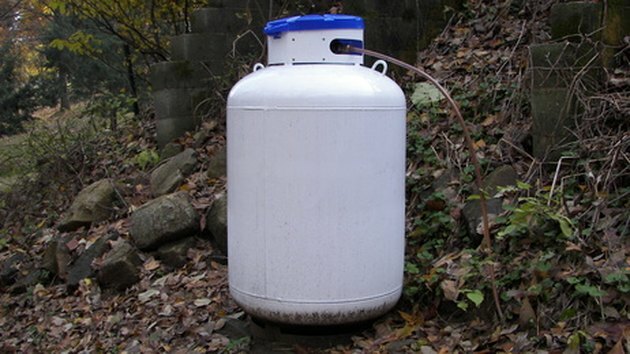 The tank should not be within 10 feet of any trees, shrubs or buildings as the propane may potentially damage anything it comes in contact with. Put on a pair of leather gloves to protect your hands from the propane. Position the tank so the valve points sideways. Open the valve until you can no longer turn the knob. Stand back until you no longer see or hear the propane shooting out of the tank. Close the valve once all of the propane is out of the tank.